Normally, I’d have a trade idea up by now, but with the Jackson Hole Summit coming up, I’ve decided to take it easy and simply sit on the sidelines. Putting on a position before the event is a risk I do not want to take. The Jackson Hole summit is a big event, as market participants are speculating that Federal Reserve Chairman Ben Bernanke will finally confirm QE3. I believe this is highly possible, but I’m not going to bet all my chips on the table before the fact. For now, I’m going to wait for what Bernanke will actually do first. If Bernanke announces QE3, I will watch price action closely to see how I can position myself. I’ve been told that a lot of traders pay attention to the 100 SMA on the daily chart, so that will be the main technical indicator that I will look at. Moving averages are usually used to identify trends and they also act as support/resistance levels. In this case, I can say that EUR/USD is still on a downtrend since it’s still below the SMA 100. But if price manages to break through after the summit, I think we’ve got a serious trend shift on our hands. 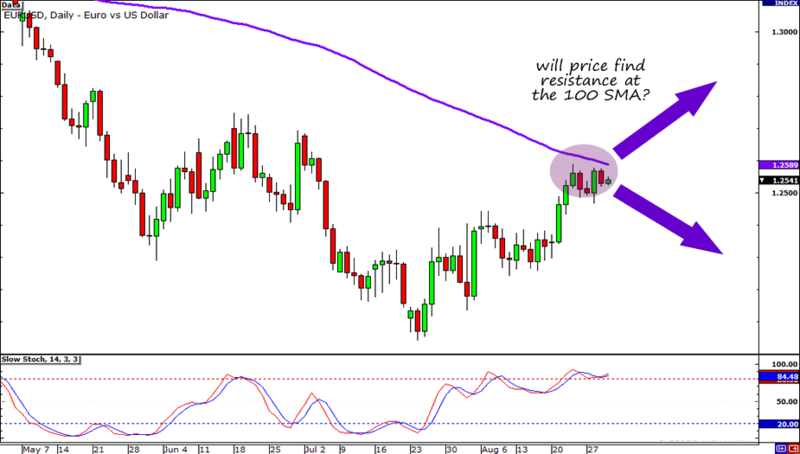 Buy EUR/USD when price closes above the 100 SMA and STAYS there on the daily chart. A break above the moving average will indicate that the downtrend is over and will confirm my bullish bias on the pair. I will then look at the 4-hour and 1-hour timeframes to see where I can jump in on the trend.